You can create an emergency grab bag for less than $150 - a lot less than what the commercial ones cost. We were able to construct a kit of decent quality for $150, significantly less than many of the commercial kits. It’s likely you can build a comparable kit for even less than this, as many of us already have spare backpacks, torches, radios and drink bottles. *Items available and prices correct as of 18 October 2018. But remember, there’s no one-size-fits-all solution. 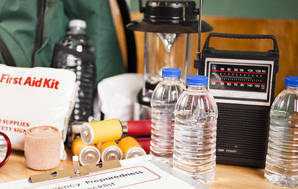 Think about where you’re most likely to be when disaster strikes, and build your kit accordingly. If you work a short walk from home, chances are you won’t need a kit as comprehensive as this. But if you commute for an hour each day from an outlying suburb you’ll need enough supplies for a long walk home, including sturdy shoes, water and snacks for energy. Getaway kits for if you need to leave in a hurry. Note that relying on a getaway bag for 72 hours is an extreme scenario. In most cases, your getaway kit will just need to get you from where you are when disaster strikes to where you need to go. We've tested pre-made emergency survival kits and found most either lack key items, contain gear of poor quality or aren't good value. There are just 2 we think are worth considering.